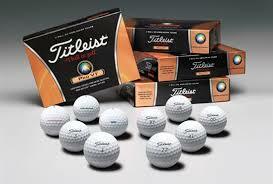 The Gents Blog Why is the Titleist ProV1 the best ball on the market? Why is the Titleist ProV1 the best ball on the market? It's easy to take the humble golf ball for granted. Traditionally, my clubs have been my most prized piece of equipment, and I know I'm not alone. Golfers tend to obsess over selecting the perfect club for each stroke, all the while forgetting that it's the ball that's played in every drive, every approach and every putt. Because of their importance, golf balls have been the subject of heavy research and development by manufacturers, and this investment has yielded significant results. The best balls now consistently fly further, land better, feel softer and last longer than budget examples, making them an easy way to significantly improve your game-play. But with so many premium golf balls on the market, which model should you choose? There are a lot of pros and cons to consider, but in the end it's results that count, right? The ball that you'll find in the hands of more serious amateurs and tour professionals than any other is the Titleist Pro V1, and for good reason. The Titleist Pro V1 has three layers, a super-soft core, an inner mantle and an ultra-durable urethane exterior. A lot of Titleists's promotional material concentrates on the core. It is their softest core to date which means that the feel of this ball is, as expected, very comfortable. From drives to putts, it's gives great response through the grip and sounds pitch-perfect when struck right. newer longer. This claim does not disappoint. Apparently, many pros who previously swapped out balls after 2-3 holes will now use one of these little beauties for 9 holes or even a full round. Even after considerable abuse from wedges and irons, this ball scrubs up perfectly and stays looking brand new for a long time. This is great to remember when considering the premium price tag, they might cost more, but they last way longer. The Pro V1's super-soft core isn't just for comfort, it allows you to significantly increase your driving distance by reducing ball-spin. Because spin slows the ball, less spin means more yards and the Pro V1 beats every other competitor on the market in this aspect. 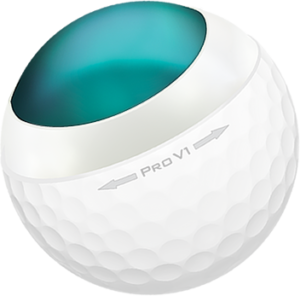 Additionally, the Pro V1 features a low launch angle that further increases driving performance. This low angle means that the ball uses more of your drive energy into moving forward, not upwards. This also means that when the ball lands, it hits the ground at a shallower angle and therefore bounces further, adding precious yards to your initial drive. As a little extra bonus, the lower launch angle also helps the ball cut through wind, meaning it performs consistently on blowy days without ballooning off into the rough. Although the core offers low spin off the tee, the outer shell and inner mantle layers of this ball actually work to create higher amounts of spin when hitting shorter approach shots - which gives you significantly more control. This characteristic means that this ball sticks to the green like no other. Longer iron shots result in a pleasing bounce-bounce-check action, while the back spin on shorter iron shots or wedge shots give unparalleled stopping power. It's easy to achieve consistent roll-back when landing meaning you can place this ball exactly where you want it. The spin performance continues even when hitting from bunkers meaning it's easier than ever to get out of challenging situations and put yourself back in the game. With the information above, we've only really scratched the surface of what makes this ball great. But the simple truth is that the Titleist Pro V1 is a stunning performer. It outclasses every other premium ball on the market, and definitely puts those random balls knocking around in your golf bag to shame. It's consistency and exceptional performance in every aspect of the game mean that it almost instinctively does what you want it to do – it spins when you want spin and doesn't when you don't. Additionally it works better than other balls in good weather and bad, and keeps looking beautiful and fresh no matter how much you hack at it. So, although it's important to keep up to date with other advances in golfing equipment, just remember that the easiest and quickest way to increase your bragging rights at the 19th probably isn't that new driver or that new club. No, it's that little white, dimpled beauty we've ignored for so long. The golf ball. Check out the Titleist Pro V1 when you can - it'll be well worth your while. Titleist Pro V1X here. I would suggest an article on a true golf icon who had tremendous style, Ben Hogan. Shorts and ankle socks? I think not, ha ha.